Directed by Cary Murnion and Jonathan Milott. Starring Dave Bautista, Brittany Snow, Christian Navarro, Arturo Castro, Jeremie Harris, and Angelic Zambrana. Dave Bautista’s career is going solidly right now. 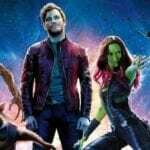 He’s seen a massive upswing following his part in Guardians Of The Galaxy (which of course gave him a sequel to appear in too as well as Avengers: Infinity War, Avengers 4 and Guardians Vol. 3 to come). He’s also got the small matter of a role in Blade Runner 2049 to come and he was the best part about the thoroughly disappointing Spectre (one point of contention was how underused he was). The path from wrestling to film is not always the easiest. Many have trodden it but the vast majority end up in straight to video fare. You could take John Cena as an example of one of the more successful transitioners, given that he’s had some mainstream supporting roles alongside his straight to video action flicks. If we’re measuring grappler success in terms of a chart then Bautista is somewhere above Cena and below the grand champion, Mr Dwayne Johnson. Bushwick arrives in one of those limited release and video on demand duel releases. This isn’t a biggie on Dave’s CV, but he shares leading duties here with Brittany Snow. The film plays out like a mixture of Red Dawn and Escape From New York. Lucy (Snow) returns to Brooklyn to visit her family. She arrives in the Subway as she and her boyfriend slowly make their way out. They suddenly realise that everyone else has gone. A muffled announcement is alarming but vague, however the sounds of screaming and a burning man running past suddenly raise the tension. It turns out Bushwick (and the rest of Brooklyn and possibly more) is under siege from an unknown threat. The boyfriend is dispatched quickly and then Lucy is on a survival mission to make her way across several blocks to find her grandmother. Along the way she runs into Stupe (Bautista) a grizzled war veteran. He reluctantly lets her tag along with him as they try to evade capture and execution. The film manages to look far fetched even in comparison to the Chuck Norris epic, Invasion USA (where a group of Russian war mongering mercs wash up on a beach and then storm the country). The plot doesn’t hold up to a great deal of scrutiny (particularly the more that gets revealed). However the film manages to get by thanks to a relentless pace. All shot in a matter of 3 or 4 long takes (with a lot of hidden cuts, some very obvious, some more subtle) and largely on steadicam the films style has plenty of visceral energy. Whilst we’ve seen this all before, and not taken quite so seriously (it really does lack a dose of irony required for this kind of thing), the choice to shoot in long takes and keep us in the moment is interesting. Snow and Bautista have a whole film resting largely on them and they hold it well. Snow steps away from those ditzy or bitchy roles she’s most known for. She’s not given much depth, but she conveys the tension of her situation and the relentlessness of it very well. Bautista is very much in that Arnold, Lundgren, Johnson etc. camp. The big buff man mountain. Very stoic and never given much credit as an actor. Like the best of those gym relishing muscle men, he’s got great presence. He commands the screen. That doesn’t just come from physical size, it comes from the ability to impose on screen. These guys don’t get enough credit. Many pretenders have come and gone and lacked much presence of charisma. Say what you want about Schwarzenegger for example, but you don’t work 40 years solidly if you’re terrible. If you don’t have something. Bautista has it, and he’s also being cast in big films accordingly. He’s good here and he’s got some chances to show some hidden depth, which he does well, even if the writing clunks at the same time. 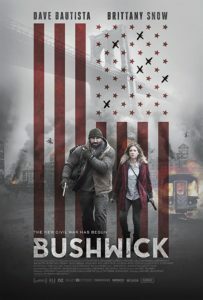 Bushwick isn’t the most memorable action film you’ll see this year but it takes the simple concept and directors Cary Murnion and Jonathan Milott inject it with persistent visceral energy to keep you watching. Given there’s a sort of intimate third person approach to the shooting, the sound is key here and it’s used effectively to establish the vastness of the attacks. 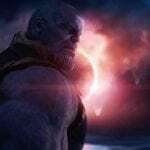 The film should prove fairly popular among genre fans.